The Pathon Series: Custom hydraulic cylinders and pneumatic cylinders that last. With the goal of offering more choices to meet customer demands, we purchased the Pathon Series of cylinders in 1983 from Cleveland-based Parker Hannifin Corporation. Although we began manufacturing our own line of hydraulic cylinders in 1967, we knew the acquisition would significantly expand our product line. Along with the Pathon Series, we're able to provide standard heavy-duty hydraulic and pneumatic cylinders, as well as custom hydraulic cylinders and pneumatic cylinders, to OEMs in a variety of configurations. Pathon cylinders are used in many industrial applications worldwide, including steel, plastics, mobile equipment, machine tools and automotive manufacturing. Standard mounting options include trunnion mounting, female clevis mounting, rod end flange mounting, blind end flange mounting, foot mounting and male clevis mounting. Built with the highest attention to detail, the non-tie rod construction incorporates a threaded head and cap design for increased strength. Pathon Series cylinders meet Joint Industry Council (JIC) dimension specifications, except for mounting dimensions. The Pathon Series heavy-duty, non-tie rod cylinders promise long-lasting, precise performance in the most demanding conditions. We can help you repair and rebuild a Pathon cylinder you already own or choose a new model that's right for your application. When you need proven quality, heavy-duty cylinders for demanding applications, our Pathon Series will meet the rigors of your jobs for years to come. 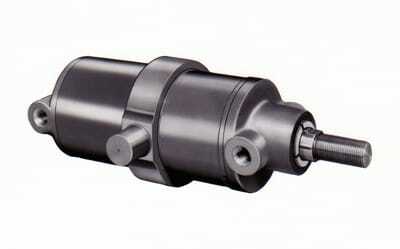 Bring precision and quality to your most demanding applications.